In 2015 we completed our own ‘Coast to Coast Walk’ from Liverpool to Flamborough and for the second half of the walk (from Leeds to the east coast) our route ran roughly parallel to the route taken by the Coastliner bus and we used that bus each day to get back to our parked car. The thought crossed our minds that the route we had taken from Leeds to the coast could, with just a little tweaking, be made into a Long Distance Walk. That’s what we have done and we are calling the walk ‘Coastliner Way’. The attraction of the Walk is that each leg starts and finishes at a Coastliner bus stop. This means that, apart from getting to the start of a walk, there is no need to use private transport. 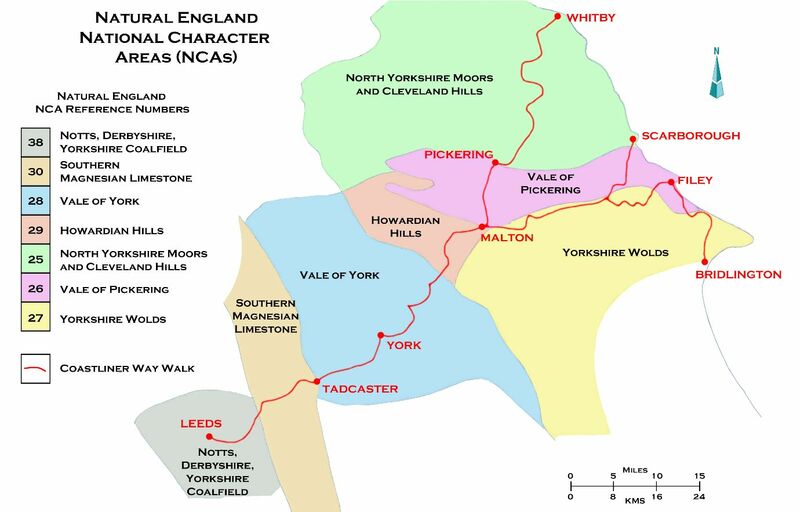 As far as the route itself is concerned, we first walk from Leeds to Malton. 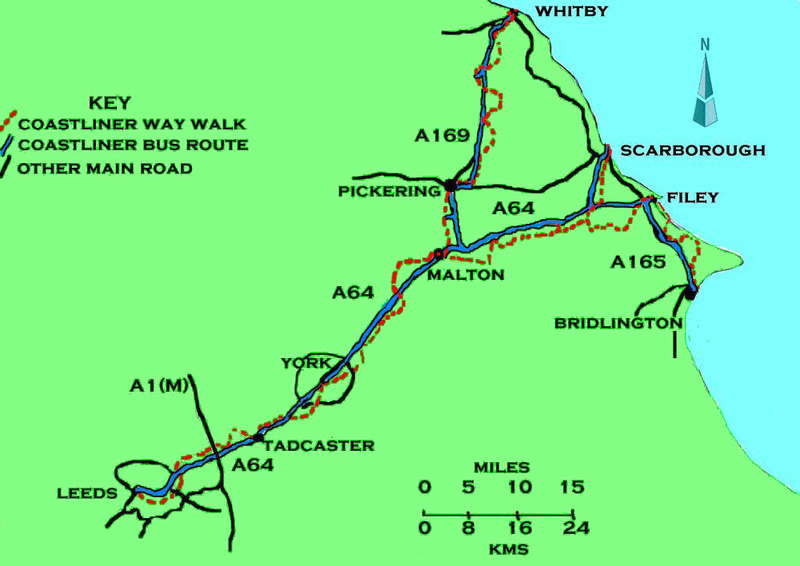 From there, three separate branches, corresponding to the 840, 843 and 845 Coastliner buses, lead to Whitby, Scarborough and Filey/Bridlington respectively, giving walkers a choice of routes to the coast. Each leg of the walk averages about 7 miles long. Total distances (including the three separate branches) add up to about 170 miles. The Coastliner 845 bus route from Staxton to Filey and Bridlington has been cancelled as from 1st July 2018. It has been replaced by the express service X43 which runs from Staxton to Scarborough Railway Station and then down the coast, stopping only at Filey, Primrose Valley and Bridlington. This new service will only operate once a day (Monday to Saturday and not Sunday) during July and August 2018. The service will be reviewed for the following year. This means that Walks 21, 22 and 23 of the Coastliner Way can no longer be completed using the Coastliner bus. However, if you do wish to follow these three sections of the trail it will be possible to do so using a two car system by parking one car at the end of the day’s walk. Natural England (formerly English Nature) has divided England into 159 distinct natural areas. These are known as National Character Areas (NCAs). Each is defined by a unique combination of landscape, biodiversity, geodiversity, history, and cultural and economic activity. (Their boundaries follow natural lines in the landscape rather than administrative boundaries.) The course of the Coastliner Way passes through seven of these different Areas. This means that a great variety of Yorkshire scenery and history can be observed. Unlike our previously devised long distance walks, the Coastliner Way is not being published as a printed guide book. Instead walkers can print out details of the different walks from our website. We should point out that, in order to get virtually free Ordnance Survey mapping, we have opted to go for 1:50,000 scale maps instead of the 1:25,000 scale that we have used in our earlier walking books. Although the route descriptions and maps are technically free to print out from our website, we would ask you to make a voluntary donation to Christian Aid. A generous offering would be greatly appreciated and you can make your gift by clicking on this Just Giving link. Christian Aid is the Churches’ development charity that works for the relief of poverty among some of the world’s poorest communities. Christian Aid works through partner organisations in the recipient countries and never gives money to Governments. The two people who deserve our greatest thanks are Liz and Phil. Liz taught Nancy how to master basic computer skills and Phil set up our website for us a number of years ago and has faithfully (willingly and ungrudgingly) managed it for us since. To both we owe a great debt of gratitude. Other people we need to thank are: John Sparshatt of the Long Distance Walkers Association (LDWA) who first suggested the idea of putting the walk onto our website. Mark Phillips and Neil Coles of Natural England for their very positive response to our idea of using the NCAs as integral features of the walks. Bernie McLinden and his colleagues at the NYM National Park for help in ensuring the clearance of overgrown paths. The three farmers, George Featherstone, Andrew Retty, and Alec Ward who have generously allowed access over their land at Kirby Misperton. Nancy’s sister, Kathy Carter, has once again given us valuable help in proof-reading the route navigation material. Steph Cooper from Christian Aid has given us constant encouragement and help as the project as developed. Finally, we wish to thank all those ‘willing volunteers’ who muffled their cries of anguish as we twisted their arms up their backs and asked them to take part in the inaugural Launch Day walks. To all of you, our very warm and sincere thanks. We have used a variety of sources for the information included in the ‘Special interest’ sections of each of the 23 walks. Numerous places have their own websites; we have used these sources and included their web addresses for further details. Several locations have their own written materials and information from these documents has sometimes been used. Teaching friends will flinch with horror at this confession – in some cases we have included facts lifted from Wikipedia.